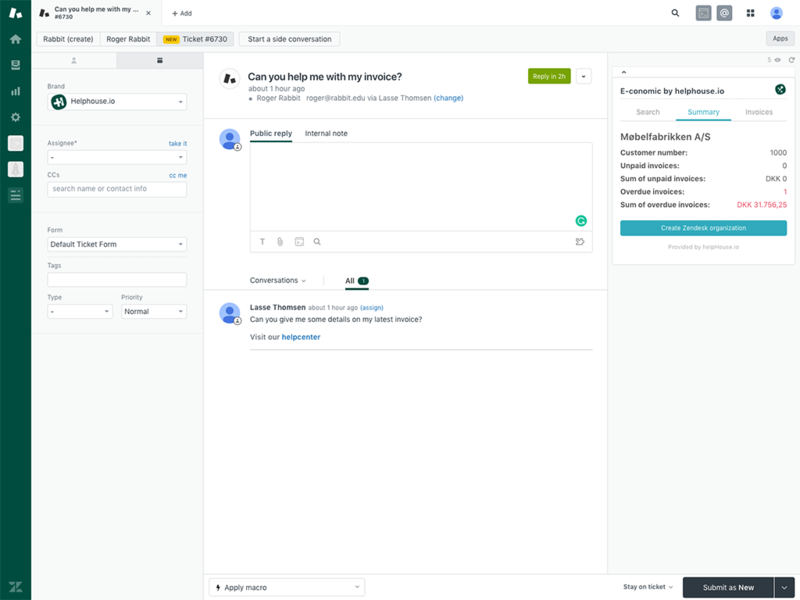 The E-conomic integration for Zendesk makes it possible for a support agent to view various information listed in E-conomic, directly from the interface of Zendesk Support. The fact that a customer has overdue invoices, can be a significant parameter in deciding what the next natural step is going to be when providing customer support. With this integration, the support agent will always be up to date with the latest information from E-conomic. This enables you to be more efficient in your workflow and saves you time and clicks since you don’t have to tab around between E-conomic and Zendesk in order to find the information you need. We’ve listed the core features of the E-conomic integration for Zendesk down below. Quickly get an overview of all the invoices the customer have in E-conomic. Your agents will be able to see whether the invoice is paid, unpaid or oven overdue. 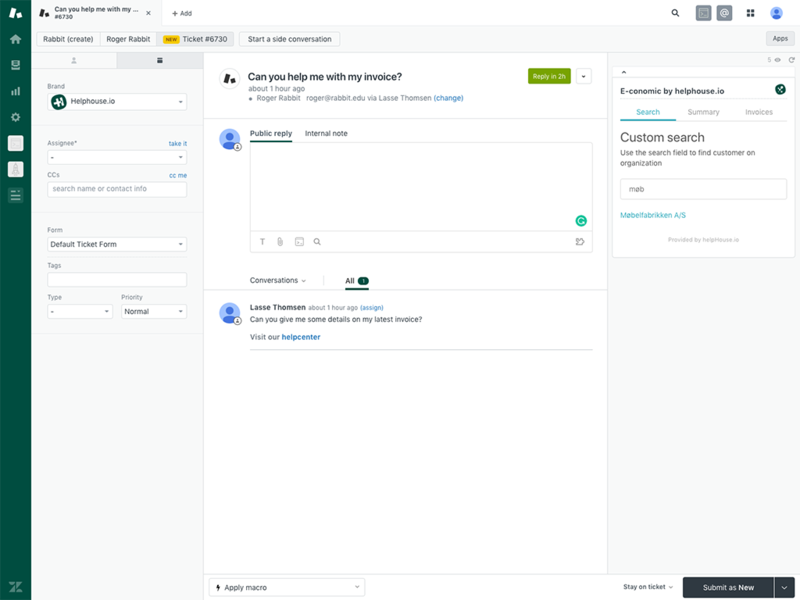 The E-conomic integration for Zendesk will automatically search for the customer from the end-users organization in Zendesk. If the end-user can’t be found, you can make a manual search without any difficulties. The integration enables your agents to see crucial information in order to solve your customers’ issue without having access to your E-conomic system. You can easily create an organization in Zendesk with information from your E-conomic system. Just use the search function and add or update the organization in Zendesk. Since the E-conomic integration for Zendesk provides sensitive information you can decide who should have access to it by groups in Zendesk. You can try the E-conomic integration for Zendesk without any obligations for 14 days, totally free of charge. If you don’t like the app, you just uninstall it and you won’t be charged. We’re fond of feedback. This is the only way we can get better. Head over to our community, if you have any feature requests or general feedback on the app. This app is made by helphouse.io. We’re a Zendesk consulting house and have helped dozens of companies saving tons of time by optimizing their workflows through custom solutions. Want help to make your Zendesk rock? Reach out at helphouse.io. Log in to the E-conomic account you want to link to the Zendesk E-conomic App. Allow Zendesk to gain access to E-conomic. Copy the Access Grant Token provided after confirmation. This key is secret and should be kept for internal use only. Store it safely, as it will be used to authenticate new agents. Paste the Access Grant Token into the corresponding field upon installation.